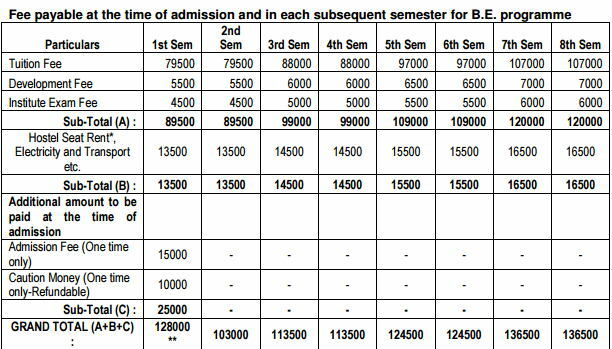 BIT Mesra Admission 2018 in B.E. 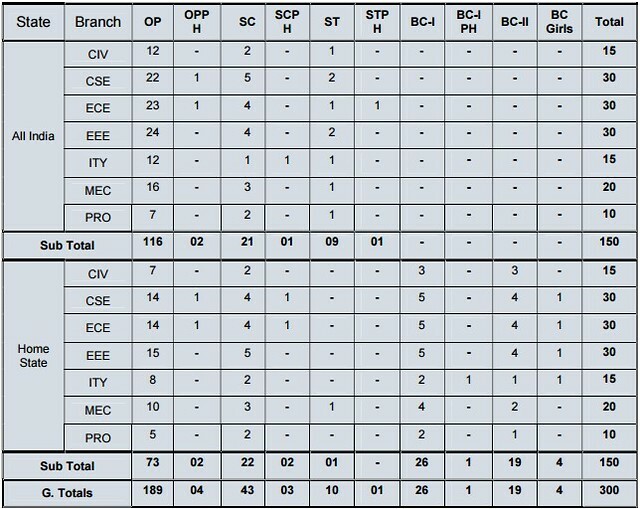 and B.Tech courses is done on the basis of JEE Mains scores. All the qualified candidates must have qualified in JEE Main to appear for BIT Mesra B.Tech admission. BIT Mesra Seat Allotment Result for Round 2 has been declared online. Only aspirants who fulfil the basic BIT Mesra eligibility criteria can register online. The last date for BIT Mesra B.Tech admission was 31 May 2018. 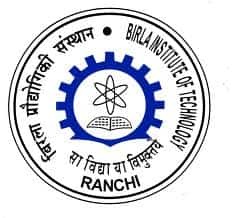 On the basis of the merit list, BIT Mesra B.Tech first list was released on 2 June 2018. Aspirants whose name is listed in the merit list have to report at the counselling process. BIT Mesra B.Tech counselling 2018 commenced from 2 to 5 June 2018. BIT Mesra B.Tech admission is the basis for undergraduate engineering courses offered in 8 campuses located at Mesra, Jaipur, Patna, Deogarh, Kolkatta, Lalpur, Noida and Allahabad. For more information on BIT B.Tech admission 2018 dates, application form, merit list and counselling, read the article below. BIT Mesra also has an international campus in Muscat (Oman) and Ras al-Khaimah (UAE). BIT B.Tech Application Form 2018 has been released. Check the link below to register for BIT Mesra B.Tech admission 2018. Latest Update - BIT Mesra Seat Allotment Result for Round 2 has been declared. 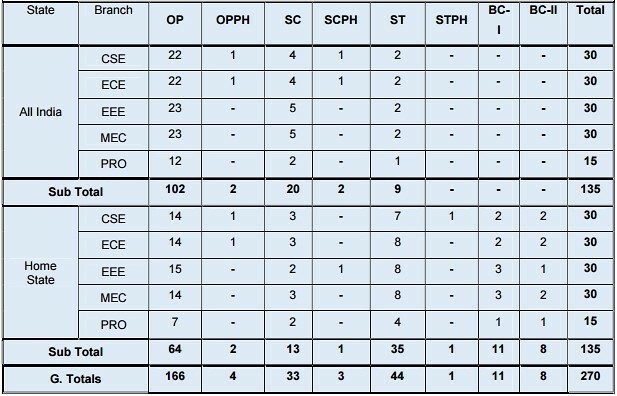 Candidates can check the important dates of BIT Mesra B.Tech 2018 from the table below. Application deadline for B.Tech and B.Arch application are different for different campuses. Schedule for 2018 is not yet released by the Institute, the following is the tentative schedule based on the last year's date. Age: Candidates whose date of birth falls after 1 October 1994 and in the case of SC/ST/PwD date of birth must fall on or after 1 October 1988. Academic Eligibility: The candidate must have passed the final examination of class 12 or equivalent examination. Candidate must have adequate proficiency in written & spoken English to cope with the programme as all instructions and examinations will be in English only. 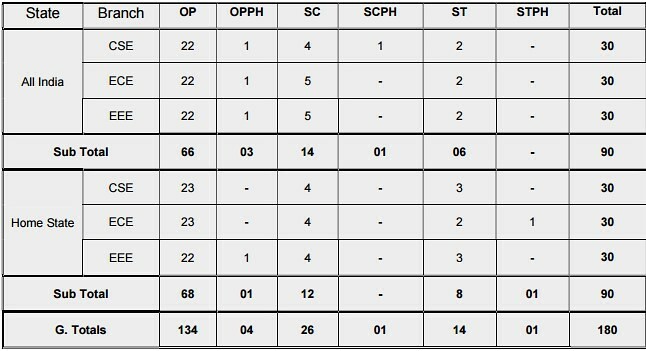 5- Any other Subject With at least 45% marks and 40% in case of SC/ST/PwD candidates in each of the subjects. JEE Main Paper 1 Rank for B.E. / B.Tech. JEE Main Paper 2 Rank for B.Arch. OBC Candidates Admission in BIT Deogarh Campus: BC-I / BC-II of Jharkhand State for admission at BIT Deoghar Campus must have passed their qualifying exam from the State of Jharkhand and should be BC-I / BC-II of Jharkhand State only. A certificate should have been issued on or after 1st April 2017. OBC Candidates Admission in BIT Patna Campus: BC-I / BC-II of Bihar State for admission at BIT Patna Campus must have passed their qualifying exam from the State of Bihar and should be BC-I /BC-II/ BC Girls of Bihar State only. A certificate should have been issued on or after 1st April 2017. BIT Mesra Admission 2018 Application form has to be filled online. Candidates seeking admissions in B.Tech and B.Arch have to register themselves by following the link below. To apply for the B.E. & B.Arch programmes, eligible candidates must complete and submit the application form online only. Candidates have to login the portal using their login ID and Password. The candidates are required to fill the application form with their credentials and personal details. After filling the complete form, the candidate will be prompted to “Save for Later” before you click on the “Generate Application Number” button. Candidates will have the option to save the form to a maximum of only three times. Choice Filling: Choices must be filled by the candidates in the order of priority.Candidates cannot modify their choices after the submission of the application form. A recent passport size photograph is to be uploaded by candidates which should be not more than 5 kb. Please ensure that all fields are correctly and carefully filled in before you finally click on the “Final Application Submission” button. Pay the application fee of Rs. 2,500 (General / OBC candidates) or Rs. 1,500 (SC/ST candidates) through State Bank Collect - net banking or debit/credit card of any nationalized bank in favor of “Birla Institute of Technology” within the given time period. The candidates have to use separate application form if they are applying for both B.E. and B.Arch programmes and also have to pay an additional application fee. The candidates can fill the BIT Patna Campus only for admissions in B.Arch Course. Transaction Reference number required after the online payment is given on the top of the payment slip generated. BIT Mesra application forms are to be submitted ONLINE only by clicking on "Final Application Submission". There is no need to send printout or any other document to the institute, however, the candidates are advised to take the printout of the application which will be required at the time of admission or counselling. Annual Fee Structure given below includes the hostel charges also.The figures given below are approx figures, subject to revision. Note- Hostel fees not included. Hostel mess charges range from approx Rs 2000 to Rs 3000. The student will continue to avail the waiver in subsequent years, provided the student has secured a minimum SGPA (General-7.5, SC/ST-7). 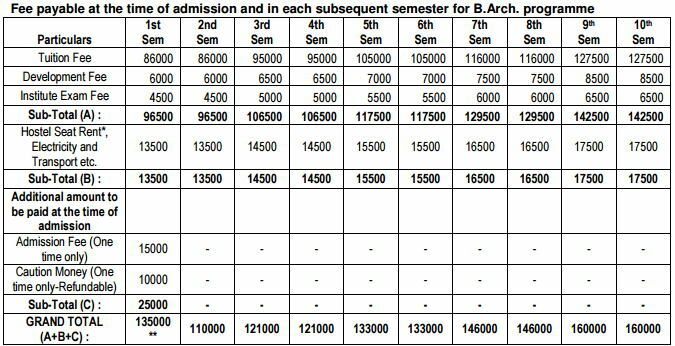 For B.Arch: Annual Fee Structure given below includes the hostel charges also. Note: Hostel fees is not included.Hostel mess charges range from approx Rs 2000 to Rs 3000. The student will continue to avail the waiver in subsequent years, provided the student has secured a minimum SGPA (General-8.5, SC/ST-7). Selection to B.E. & B.Arch at Mesra Campus would be done on the basis of JEE Main 2018 scores through Central Seat Allocation Board (CSAB) and Joint Seat Allotment Authority (JoSAA) 2018. B.E. at BIT Deoghar, BIT Jaipur & BIT Patna campuses, and B.Arch at BIT Patna Campus Selection based on JEE (Main) 2018 scores, through Institutional Counselling. A print-out of their duly completed online form. One recent colour photograph – [same as uploaded on the form] and attached by clip (write your Name, Form No and ‘BE 2018 or B.Arch 2018’ on the back of the photo). Proof of receipt of application. Set of photocopies of given documents. Cast certificate attested by Government Authority ranked not less than SDO. Admission Fee of Rs 134500 + 20,000(Boys) or 15000(Girls) (Hostel Charges,Caution Money,Mess Charges) for B.Arch. Note: It is mandatory for all the candidates to carry the original copies of which will be retained by the college for some time except photo ID. Candidates have to write their name and ‘BE 2018 or B.Arch 2018’ on the back of each of the photocopies. Seat allotment procedure of BIT Mesra Main Campus will be conducted by JoSSA for both the B Tech and B Arch courses and for BIT Deogarh, BIT Jaipur and BIT Patna will be done by BIT Mesra Counselling. The result of the seat allotment will be available at the institute's website individual call letter will not be sent to the candidates in any case.The procedure of seat allotment for B.Tech Admissions is given below. Candidates who are allotted seats have to report to any of the 3 campuses (for B.Arch candidates have to visit BIT Patna Campus only) for document verification and admissions. If the candidate does not appear in the institute for counselling their admissions will be terminated. Seat allotment consists of the four rounds. 1st Round of counselling will be common to all candidates and Round 2nd, 3rd and 4th will be conducted against the availability of the vacant seats in all the campuses.Results of each round and number of available seats will be given on the official website. 3 options will be provided to each candidate after 1st round ofcounselling. Option I - If the wish for upgradations of seats in any of the 3 campuses. Option II - If they wish for upgradations of the seat in the same campus. Option III - If a candidate is satisfied with his/her allotted seats and do want upgradations. Candidates can report to any of the 3 campuses (BIT Patna only for B.Arch) till 3rd round of counselling but in 4th round candidates have to report to the respective campus only. Candidates, whose branches have been upgraded in the 2nd and 3rd rounds need not report physically again at the Campus, will be required to log in on the Institute website for their response [mandatory]. If a candidate does not respond within the stipulated time after his/her branch up gradation, it will be presumed that candidate is fully satisfied with the upgraded branch and do not want to participate in the further rounds (if any). Candidates, whose branches have been upgraded in the 4th round, should physically report at the allotted Campus only within the given period of time.